El Perro Del Mar is a Swedish band formed in 2003, fronted by Sarah Assbring. They released their debut album, "Look! 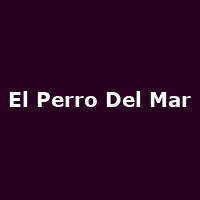 It's El Perro del Mar!" in 2005, followed by: "El Perro del Mar" (2006), "From the Valley to the Stars" (2008), "Love Is Not Pop" (2009), "Pale Fire" (2014) and 2016's: "KoKoro".